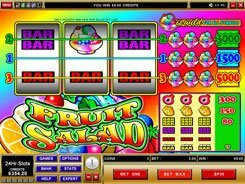 The Fruit Smoothies three-reel slot features vibrant colors, the Vegas Strip on the background and a bunch of fruits all over – all creating a festive look and feel as you spin the reels. 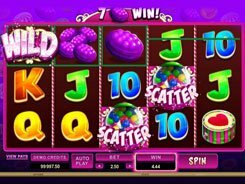 Hitting three identical symbols on the single payline, you do not get cash rewards, but earn 1 to 15 winspins that are kind of like free spins. You are then taken to a second screen where the real gaming action starts. 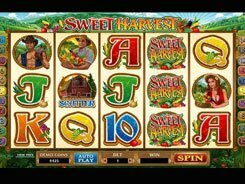 During the winspins you are awarded 1 to 500 coins for three matching fruit symbols landed on an active payline. Besides, three Extra Spin chips add a random number of additional spins. You can wager $0.1 to $10 per spin, thus the top reward reaches an impressive $5000 loot. 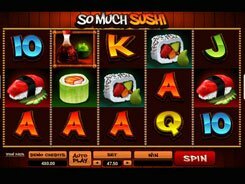 In a regular game, you can grab various bonus extras such as Nudge Repeat, Nudge Gamble or Nudge Bank Held – all giving you even more chances to score big and take away a decent cash prize. 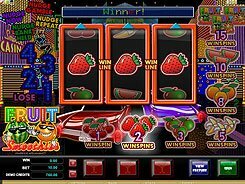 In conclusion, Fruit Smoothies is a cheery feel-good video slot with generous and plentiful bonuses for an exciting experience. PLAY FOR REAL MONEY!